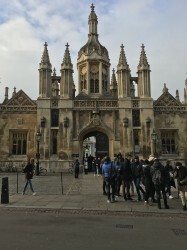 Prof. Xue was invited by the Center of Intellectual Property and Information Law of Cambridge Law Faculty to lecture to the faculties and graduate students on January 16-21, 2019. 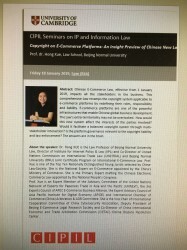 Prof. Xue Lectured on “Copyright on E-commerce Platforms: An Insight Preview of the Chinese New Law”. Chinese E-Commerce Law, effective from 1 January 2019, impacts all the stakeholders in the business. This comprehensive Law revamps the copyright system applicable to e-commerce platforms by redefining their roles, responsibility and liability. E-commerce platforms are one of the powerful infrastructures that enable Chinese global business development. The Law’s extra-territoriality may not be overlooked. How would this new system affect the interests of the parties involved? Would it facilitate a balanced copyright system through multi-stakeholder interaction? 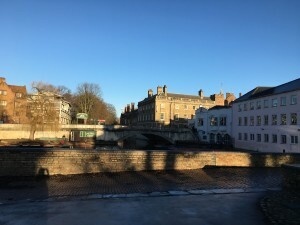 Is the platform governance relevant to the copyright liability and law enforcement? Prof. Xue explored all these questions and exchanged the views and opinions with the faculties and students. Prof. Xue also answered a couple of questions raised by the audience. All were highly interested in the Chinese new Law and looked forward to knowing more from Prof. Xue.